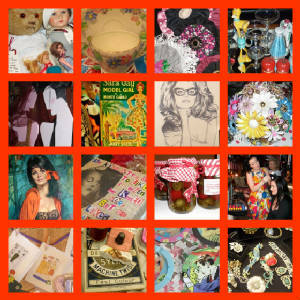 The Totally Bazaar Vintage & Handmade Fair will showcase a fantastic mix of 50 vintage dealers and Irish creative designers – offering both genuine vintage and upcycled fashion, jewellery, homewares, and collectables from the early 1900s to the 1980s. Add vintage hair and beauty makeovers, scrumptious cupcakes and decadent handmade chocolates into the mix, and wrap it up with live music with a retro flavour and you have a vintage shopping extravaganza that is also an entertainment Event with a capital E! Take a seat in the Buskers’ Den and play retro boardgames while relaxing to cool and contemporary sounds with a retro twist. The line up of musical talent for 3rd April is Della Storm, Mike Donaghy, Tracy Dempsey, Amanda Agnew, Katie Richardson, Kerri Quinn, Geoff Hatt, Alison McGuinness and Robyn Farah. In honour of it being Mother’s Day all Mums, daughters and grandmothers will be entered into a free draw with a chance to win a glamour hamper including hair and beauty vouchers, fashion accessories, jewellery, vintage china teacups, speciality teas, wine and handmade chocolates. Lots of other special offers and giveaways will also be taking place during the day!